Jay Garmon [dot] Net: Truly Trivial: How did Apple infamously deal with their unsold inventory of Lisa computers in the 1980s? Truly Trivial: How did Apple infamously deal with their unsold inventory of Lisa computers in the 1980s? 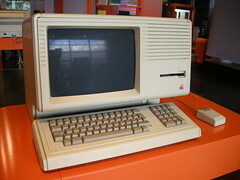 The Apple Lisa was the first commercially available stand-alone PC to employ both a graphic user interface (GUI) and a mouse. Developed under the direct supervision of Apple cofounder Steve Jobs, Apple intended the Lisa to revolutionize office computing as an all-in-one technical solution. Beyond the GUI and the mouse, the original Lisa boasted several hardware and software features that were well ahead of their time. ... Too bad the Lisa cost almost $10,000 per unit and suffered woeful performance lags. The exorbitant amount of RAM and other high-end features made it significantly more expensive than IBM PCs and Apple's own Macintosh, which itself ran a faster, leaner GUI. These drawbacks helped ensure that the Lisa never gained any significant market traction or adoption. After six years of frustrations and failures, Apple finally took a drastic and somewhat poignant measure to rid itself of the last 2,700 Lisa PCs it had in stock in 1989. HOW DID APPLE UNLOAD ITS FINAL UNSOLD INVENTORY OF THE ORIGINAL LISA COMPUTER?